Successfully Added Chairman Mao's Laptop Cooling Pad to your Shopping Cart. Chairman Edition Laptop Cooling Pad with Mao’s Calligraphy. Sometimes you need cool laptops and cooler heads, even if you're a world leader in tech or politics. Laptops, notebooks, search engine owners and Red Guards in a struggle session all share one common problem: overheating. After several hours of continuous use, even the most revolutionary laptop these days runs the danger of cooking its own hard drive like a bowl of Beijing fried noodles. Now there is a solution - Chairman Mao Ze Dong's Laptop Cooling Pad! Chairman Mao's beautifully designed laptop cooling pad keeps your computer, your lap, and your revolutionary fervor running cool. Simply place your laptop on the cooling pad, connect the cooling pad to a free USB port on your computer, and you're free to continue emailing PDFs to your 'friends', reading your copy of The Little Red eBook, and watching The Red Detachment of Women on your computer. Twin heat sink fans begin working silently right away, sucking heat and counter-revolutionary sentiments away from the bottom of your laptop, cooling it, harmonizing it, reforming it through labor, and dissipating it safely. You will notice improvements in the performance of your computer immediately, as your laptop computer runs cooler, safer, and more ideologically correct. Everyday functionality is matched by outstanding craftsmanship, beautiful design, and revolutionary zeal. The sturdy aluminum body of Mao's cooling pad supports the lightest netbooks and the heaviest laptops. An ergonomically-designed body lets you view your laptop screen easily and type comfortably. The best part of the design is of course the beautiful Chinese calligraphy - a poem composed by the Chairman himself! With wide application and a stunning design, this laptop cooling pad is sure to be a hot seller. Cadres, Young Pioneers, the proletariat, and even Google employees all love this cooling pad! Order in bulk to enjoy greater savings and be the first among your capitalist competitors to distribute this amazing item to the masses. Available at an unbeatable price from your leader in revolutionary gadgets, Chinavasion. What is the poem on the face of Mao's laptop cooling pad? The poem is "Qinyuanchun - Snow (沁园春 - 雪)", authored by Comrade Mao Ze Dong in 1936 and published in 1945 during Mao's peace talks with Chiang Kai Shek (Jiang Jie Shi). The calligraphy printed on the laptop is also Mao's own handwriting. What does the poem mean in English? North country scene, a hundred leagues locked in ice, a thousand leagues of whirling snow. Both sides of the Great Wall, one single white immensity; The Yellow River's swift current, is stilled from end to end. The mountains dance silver snakes, and the highlands charge like wax-hued elephants, vying with heaven in stature. On a fine day, the land, clad in white, adorned in red, especially enchanting. But alas! Qin Shi Huang and Han Wudi were lacking in literary grace; And Tang Taizong and Song Taizu had little poetry in their souls. That proud son of Heaven, Genghis Khan, knew only shooting eagles, bow outstretched. All are past and gone! For truly great men, look to this age alone. 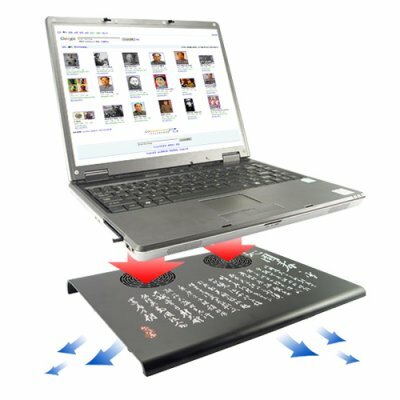 How do I power this laptop cooling pad? Does it need to plug into the wall? Does it need batteries? All you need to power this laptop cooling pad is a laptop. The included power cord connects the cooling pad to a USB port on your laptop. That's it! Amazed that the product reached me so quickly. lol such a grate item. Thanks a million! I love how you guys Photoshopped the laptop cooler into some old Photos of Mao! That is so creative. on 2009-06-05 12:25:18 You gotta love chinavasion! I just love these guys "Chairman Mao's Laptop Cooling Pad" you gotta love chinavasion! on 2009-06-03 00:05:51 Very Funny Description of Chairman Mao's Laptop Cooling Pad. I am happy to see that ChinaVasion has a GREAT sense of humor. The description is VERY funny and I had a big smile this morning.